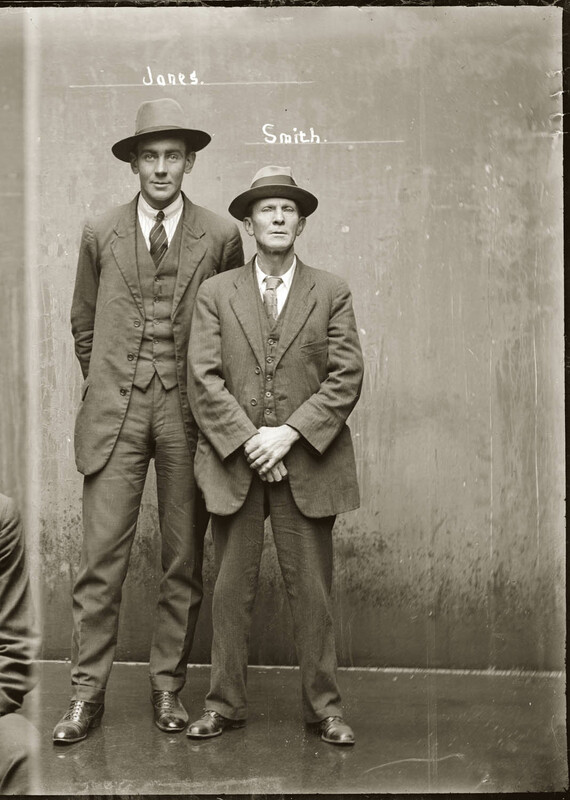 Mug shot of Thomas Sutherland Jones and William Smith, 15 July 1921, Central Police Station, Sydney. constructed out of a potent alchemy of inborn disposition, personal history, learned habits and idiosyncrasies, chosen personal style (haircut, clothing, accessories) and physical characteristics." suggests that, compared with the subjects of prison mug shots, "the subjects of the Special Photographs seem to have been allowed - perhaps invited - to position and compose themselves for the camera as they liked. Their photographic identity thus seems Special Photograph no. 439. Smith and Jones are listed in the NSW Police Gazette as charged with stealing seven packages of twine (value 14 pounds). Jones was further charged with stealing thirty horse rugs (value 15 pounds) and two bales of kapok (value 20 pounds). Smith was fined 20 pounds; Jones was sentenced to 18 months hard labour, suspended. Peter Doyle with Caleb Williams City of shadows: Sydney police photographs 1912-1948 Historic Houses Trust, 2005, pp.220, 238.